According to Marx in a classless collectivist society complete material abundance prevails, enough to guarantee the satisfaction of any individual subjective needs, the material pleasure of its members could be spontaneously achieved without requiring an institution of general norms of distribution, which everyone must adhere to. Marx firmly believed that a high growth of productive forces and a complete elimintion of material scarcity were absolutely necessary conditions for communism. For Marx the essence of the social problem is not that the worker does not entirely take the product of his work. On the same ground he categorically rejected ideas about ‘equal right’ to material rewards or ‘equal distribution’ of social wealth on the basis of the labor contribution of the economically active members of society. On the contrary, he argues that such a principle (‘an equal pay for equal working time’) may introduces a true ‘equal right’, which in reality is an ‘unequal right for unequal work’, since everyone is valued by work as a general and a narrow criterion, because thereby ignoring the particular natural endowment and the subjective needs of the people. ‘This equal right is an unequal right for unequal labor. It recognizes no class differences, because everyone is only a worker like everyone else; but it tacitly recognizes unequal individual endowment, and thus productive capacity, as a natural privilege. It is, therefore, a right of inequality, in its content, like every right. Right, by its very nature, can consist only in the application of an equal standard; but unequal individuals (and they would not be different individuals if they were not unequal) are measurable only by an equal standard insofar as they are brought under an equal point of view, are taken from one definite side only – for instance, in the present case, are regarded only as workers and nothing more is seen in them, everything else being ignored’. The Marxian concept of communism is not based on any principle of ‘social justice’ which aims to economically equalize people. According to Marx a system of distributive egalitarianism based on mandatory offered equal working time leads to the denial of special individual personality of each person since it does not allow him to ‘positively’ overcome private property, which consists in the appropriation of all social wealth by man on the sole criterion of the particular individual needs (‘from each according to his abilities to each according to his needs’). Marx considers as ‘vulgar’ a conception of communism in which all members of society are equated and converted into workers paid equally by the community, which has turned capital into collective ownership. He emphatically stressed that a classless society must necessarily be based on a social surplus value whose abundance greatly exceeds the material wealth produced in capitalism to guarantee personal consumption, which, precisely because the complete abundance which had been attained, doesn't need any regulatory authority. The application of Marxian communism today is now encountering major problems and insurmountable obstacles, which did not exist in the middle of 19th century. They were unthinkable for Marx and Engels, and even for the communists at the beginning of the last century. In the era of the founders of Marxism, capitalism was far from being an international market and the bourgeois industrial society was limited to a small group of developed countries. Moreover, Marx and Engels, like most radical socialists of their time, shared the general hyper-optimism about the liberating possibilities of industry and technology, and the availability of natural resources gave the impression that they are inexhaustible. In those days the current threat of a planetary ecological collapse would look rather like malicious science fiction. Moreover, the world’s population and the general level of consumption, even in the developed countries, were well below the level of today. The vast majority of the ‘dangerous classes’ in the few industrialized countries of the time was actually excluded from consumption, often even from obtaining the bare necessities of life. When Marx described communism as a society of superabundance he certainly didn’t anticipate modern Western societies of mass consumption. The general communist claim which emphasized a greater development of productive forces in order to meet people’s material needs was not based in the pursuit of a lack of restraint in consumption and in establishing an individualist pleasure-seeking society, but in securing the basic means of living for all, so people could be free to devote themselves to a multifarious expression of their creativity, to educational and culture development. It is obvious, however, that distribution according to material needs requires people to act using more ethical than material criteria. In any case Marxian communist society of abundance could not be identified with consumerism (see Marx’s analysis on commodity fetishism in the first volume of ‘Capital’ as an example of this). Today, however, a view of communism as a society of overabundance, which is interpreted as mass consumerism, either as a Western reality or as a global ideal, is nothing but impossible and destructive. If the necessary material starting point for the transition to communism is the most developed capitalism, then a generalization of Western way of life throughout the world will mark a rapid and total collapse. In a modern communist project a classless society could neither start from an even higher level of production and consumption, compared with the present one, nor could give to its members the opportunity to freely satisfy their material needs. 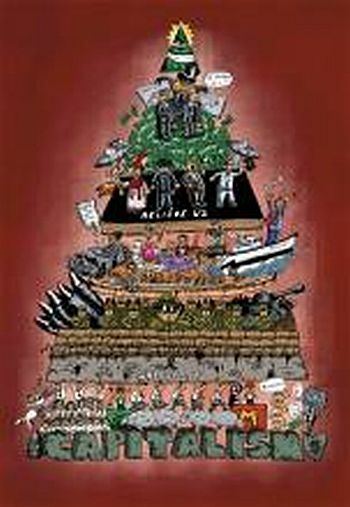 Instead, its starting point would be a radical distribution of the existing material wealth to the whole of humanity, which is sufficient to meet the basic needs in terms of equal distribution, the destruction of entirely harmful or unnecessary branches of the economy, the escape from the vicious circle of unlimited creation of needs and products and the disruption of accumulation. To put it simply, communism does not means ‘Ferrari for all’, but it can even entails a generalization of the pre-war ‘American dream’ ‘a car for every family’. Certainly it would be unfair to blame the founders of Marxism because they didn't foresee in their time the material consequences of today’s ‘mass society’. But it would be equally absurd to stick to the ‘letter’ of some short paragraphs, which ultimately they wrote only incidentally, without systematic analysis and based on the conditions of their time. Otherwise we convert Marxism from a method of analysis of social relations to a method of analysis of texts. Modern communism means the application of distributive justice based on the socialization of the means of production, the intercommunity of goods, social solidarity and the comradely work of associated producers. That means a break with the messianic visions of the founders of Marxism for a communist society inherent in the absolute material abundance. Today’s mission of communism, as a humanitarian liberating project, is the establishment of self-sufficiency in material goods and necessary services for all people under the criterion of frugality and not abundance. The element of moral concern for human dignity, an element declared from communism and inherent in the true politics, is the necessary condition as for a successful dealing with the critical problems for the existence of humanity as for the prosperity of the future generations. In fact, the moral level of a society depends on the protection of its weakest members and the care for the next generations; at least, these generations who will live in the foreseeable future. And it is obvious that any achievement of material prosperity is strictly defined by the narrow confines of natural environment, so communism can be described best as a system that will not consume resources faster than they can be renewed nor produce waste faster than it can be absorbed by nature. In this way we save the spirit of the Marxian conception and we preserve in full the principle of priority of needs to the distribution of material goods, which is one of the constituent principles of socialism in general. The current explosive and unprecedented global problems put humanity at a crossroads: either the international bourgeoisie will administer them in a way to preserve and enhance their privileges that will lead to a new barbarism or these problems will be solved by a global communist society. The current economic, environmental, energy, food and population crisis sets the basis for the modern dilemma “socialism or barbarism”. This crisis is an established fact. The challenge lies in resolving this situation. The modern capitalist decline is taking the form of a relentless competition for the redistribution of global resources. A communist movement free from the idolatry of abundance must establish a classless society based on self-sufficiency in terms of frugality. Within this framework communism has to undertake a titanic work, unprecedented in human history: a transfer of resources from the rich to the poor countries in a global scale in order to distribute the world’s wealth to cover the basic needs of existence of all the members of humanity in conjunction with the achievement of full employment, a fair division of self-sufficiency to all working people and their families, special care of the weaker members of the species and reduction of working time in order to release more free time for participation in communal activity (citizenship?) and for the development of human personality. A communist movement (...) must establish a classless society based on self-sufficiency in terms of frugality. One of the historically progressive aspects of capitalism is that it is a system that produces ever expanding needs. The problem lies in the fact that the class relations within this mode of production have become a fetters for further development of the productive forces, by preventing the rational application of new technologies to production. If we take the issue of ecological sustainability, already the technology exists to begin producing food using recirculated water agriculture in vertical farms. Currently agriculture accounts for two thirds of global fresh water consumption and contributes the majority of pollution of the environment and is the main reason for the destruction of old growth forests. Using vertical aeroponic farms we could produce the same amount of vegetable food using 95% less water and far less land, as soil is not necessary for this type of agricultural production. Production could be arranged in such a way that practically there is no waste, using the natural environment as a model. Realistically, there is no other way to feed the 9-10 billion people that we can expect by the end of the 21st century. Moreover, if we weren't squandering resources on a suicidal arms race between imperialist powers we could begin to exploit metals and volatiles from near earth asteroids. One metallic asteroid composed of mostly iron and nickel could provide more of these metals than is present in the entire Earth's crust, without the need to destroy the natural environment. The problem is not primarily one of limited resources, of running into a wall of scarcity. It is that this system based on anarchic production for exchange is preventing us from becoming a truly scientific civilization. The technical solutions already largely exist. Thanks for that Stavros. The same comment has been made by some ICT comrades (without your technical knowledge) but this issue is a discussion and the Greek comrades have to write in English (which we then edit to make grammatical) so maybe "frugality" was not quite what they meant. Certainly though that is a useful contribution. This incredible, fabulous, amazing and mind-teasing quote from the Gotha Program just about sums up everything that can be said about Marx, Marxism, communism, the proletariat, the revolution and the future awaiting humanity if we can just get it together and rid the world of the rabid backward looking pest known as the bourgeoisie. Ah! The right to be unequal. Not just "different" in the bourgeois way of eccentricity. Not just "equal" in the stupid childish way of the bourgeoisie who think equality is expressed through access for everyone, rich and poor, once every few years to some antiquated ballot box in a curtained closet which serves as a substitute for democracy. But the right to be unequal. To have it recognised and be accepted that people have individual endowments that are not to be measured competitively against each other on some scale called "equality". But to have it understood instead, through consciousness and solidarity, that under communism we have achieved at last the right of inequality precisely because we are all unequal! So communism becomes paradoxically the freedom not just from the slavery of wage labour but from the phoney and imprisoning freedom of equality! Bliss will it be in that dawn to be alive and gloriously unequal. In the main article, moral concern is rated very highly, maybe correctly, but then it calls for 'a transfer of riches from the rich to the poor countries in a global scale.' Recently in the UK the Tory government is cutting back on 'foreign aid' on the basis that productivity is increasing rapidly in some Asian lands. Maybe sooner or later it won't be a matter of the 'West' sending mega food and clothes parcels east, but of those in Asia continuing to be poor, though continuing to be exploitedly productive, deciding to come and 'collect' whatever is going in the 'West', as current news suggests. Whatever takes place in months and years ahead, society everywhere will always need to have work done to meet its many requirements, so life will never be a non-stop holiday for all, even if technology will help us. But having said that, sacked steel workers under capitalism seek work.